It's preview time. This was originally published on July 10, so, well before running back Jeremy Larkin had to medically retire from football. Which is very sad. All week, Nebraska's coaches passed along their sympathies. While his health is more important than anything on the football field, losing Larkin is a huge, huge blow for the Northwestern offense. The Wildcats had 8 yards rushing on 20 carries last week. They had 34 carries for 28 yards the week previous. And the season numbers look pretty rough, too. They rank 120th in the country in opportunity rate, 123rd in marginal rushing efficiency and 129th in stuff rate. So, as is the case when a team can't really run the ball, they've completely turned away from the run. Northwestern throws it on standard downs more than all but three teams in the country and throws it on passing downs more than all but 20. Which, as I'll point out later in this piece, is a total departure from a season ago. Northwestern has put the ball in Thorson's hands and is off to a second consecutive 2-3 start. Thorson hasn't really been terrible, either, he just hasn't been great. He's got six touchdowns, five picks and a 62.1 percent completion rate. Northwestern has been very average in terms of efficiency and protecting Thorson (weird because they can't run block) but the passing game is one of the least explosive in the country this season. So you have no threat of a run game, you're not effective trying to chew up yards at a time and you're not elite at just grinding out yards. That all adds up to the 12th-worst scoring offense in the Big Ten. NU ranks only one spot ahead of the real NU. Saturday should be an electric morning. The defense hasn't been good enough so far to make up for a lackluster offense. Northwestern's unit ranks 10th in the Big Ten in yards given up, 11th against the pass, seventh against the run and eighth in scoring. Let’s look at two teams' defensive numbers against the run last year: Team O and Team P. (Everyone always goes right to X, Y, Z; give the middles some love.) Team O won a lot of games. Team P won a lot of games. Team O is Northwestern. Team P is SEC Champion, CFP-participant Georgia. Obviously, we’ve excluded the pass defense from this little exercise so you’re only getting half the picture, but the objective here isn’t really to say, “Hey, Team O’s defense is superior to Team P’s.” This stuff is all about getting a reaction out of the reader similar to the one I had when I looked at Northwestern’s defensive numbers last season. Seven starters return to the unit — including All-Big Ten second-team linebacker, sophomore-to-be and leading tackler Paddy Fisher and All-Big Ten second-team defensive lineman and sacks-leader Joe Gaziano — and they demand your respect. 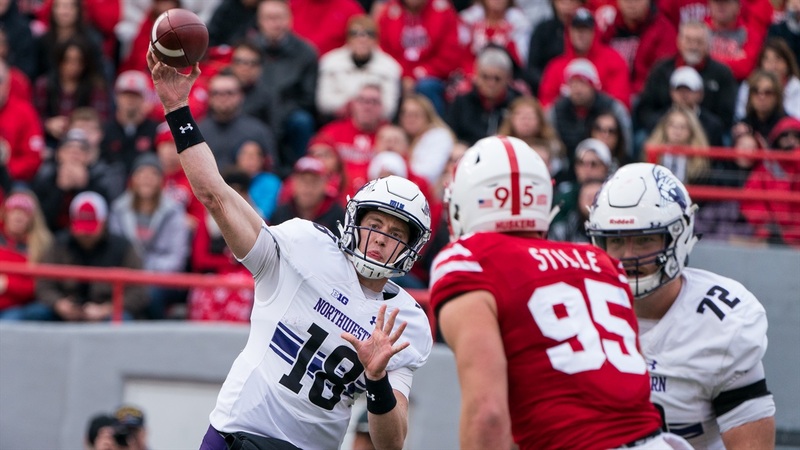 Because, at least from the outside, it seemed like the national talk about Northwestern was dominated by quarterback Clayton Thorson, last year’s star running back Justin Jackson and the offense. It’s understandable. Jackson was one of the best in program history. He finished his career with 5,440 rushing yards, 41 touchdowns and a 4.8 yards-per-carry average. The career yardage is the third-most by a Big Ten back since 1956. As for Thorson, it feels like he’s been around forever and he’s already projected by one NFL mock to be the third overall pick in 2019’s NFL Draft. But back to the defense. The run defense was outstanding a season ago. Only once all year did a team have a yards-per-carry average above 4 yards against the Wildcats. Five times the opponent was held below 3 yards. The unit ranked second in the Big Ten in defensive rushing yards per play, only behind Ohio State. Five of the front seven are back, the major components from the run-stopping, pass-rushing bunch. So, if there’s a question mark, it’s in the secondary. Both starting safeties — Godwin Igwebuike and Kyle Queiro — are gone; 67 combined starts just out the door. The Cats are also losing corner Marcus McShepard, but safety will be the position to watch in the backend of the backend. Northwestern was still a top-50 unit in passing yards per play (36th) and explosive pass play percentage (21st) and those are good starting points but the defense has gone from 13th to 61st in passing success rate in two seasons. So if there’s even a little bit more slippage in other areas and Northwestern has aspirations of being more than just the No. 2 team in the West, it’ll be the offense that needs to pick up the slack. Given the graduation of Jackson, it would probably be more accurate to say Thorson needs to pick up the slack. The Wildcats averaged more pass attempts in losses than they did in wins. When Thorson was asked to do too much, things went south. In Northwestern’s three losses he had the same number of interceptions (six) as he did in the 10 wins. He also had a worse completion percentage (63 percent in wins, 54 percent in losses). Remember the Wisconsin game, the game Northwestern was leading and then still in late until Thorson took a safety rather than throwing it and seeing what happened? That’s the decision-making we’re talking about here. Thorson has been a part of 27 wins and 12 losses as a Northwestern quarterback. He throws 7.2 more attempts a game in losses, completes 53.6 percent of those passes in losses (59.4 in wins), and has a quarterback rating 30 points lower in losses than wins (127.6 down to 97.6). Sure, most of the time quarterbacks in losing efforts are going to have worse numbers than in winning efforts so Thorson’s touchdown-to-interception ratio probably paints a little bit better picture than just looking at his attempts in a vacuum. In wins, he has slightly above a 2:1 TD-to-INT ratio. In losses, he has nearly a 3:4 TD-to-INT ratio. Excuse me while I go throw up. Teams that can force Thorson to take the game and put it on his shoulders are going to win more often than not. Where does that leave us? Four of five starters from last year’s line are back, along with last year’s reserve tailback and probable breakout candidate Jeremy Larkin. As a freshman, Larkin averaged 6 yards a carry, ran for 503 yards and tallied five touchdowns. He should become a focal point of an offense that entered the opponent’s 20-yard-line on 33.7 percent of possessions (38th in the country) and converted those trips into points 69.5 percent of the time (25th in the country). They ranked seventh in the nation in power success rate, a number that tracks third- or fourth-down runs that need 2 yards or less. Big boy football. That’s as much to do with the line as it is with the back. Things should be okay on the ground as there’s a little bit of depth behind Larkin, too. The team won 10 games last year after a 9-4 prediction. ESPN’s FPI has them at roughly 6-6 this season. If head coach Pat Fitzgerald is looking back on his 2018 year knowing they avoided that kind of regression, it’ll be because Thorson lived up to that “No. 3 overall pick” hype and bumped up the offense’s output. Ranking 98th in yards per play, 105th in explosive play percentage and 59th in yards per point just isn’t a top-tier team regardless of how good the defense is. Offensive coordinator Mike McCall likes to put his quarterback in advantageous passing situations (they run less than the national average on standard downs and more than the national average on passing downs) and that won’t be changing this season, so the improvement has to be with Thorson. The road schedule this season isn’t terrible — Purdue, Michigan State, Rutgers, Iowa, Minnesota — so that’s a plus; the big ones come in Evanston, Illinois, at Ryan Field. There’s a murderous stretch in the middle (Michigan, at Michigan State, Nebraska, at Rutgers, Wisconsin, Notre Dame) so good luck to the Cats on trying to navigate that. In 2017, the Cats lollygagged out of the gates to a 2-3 start before winning the last eight. Do that again and 6-6 looks perfectly reasonable. But come out strong? The defense gives these guys a reason to think this can be a special season if some things break the right way.